As time went on, and patterns began to become recorded and written, individual stitches evolved such as the : The Trinity or Blackberry stitch is said to represent the Holy Trinity, which is done by making 3 stitches from one and one to three across the panel hence it’s name. The Cable Stitch is a depiction of the fisherman’s ropes, and represents a wish for a fruitful day at sea. The Diamond Stitch reflects the small fields of the islands. These diamonds are sometimes filled with Irish moss stitch, depicting the seaweed that was used to fertilise the barren fields and produce a good harvest. Hence the diamond stitch is a wish for success and wealth. The Zig Zag Stitch, a half diamond, is often used in the Aran Sweaters, and popularly represents the twisting cliff paths on the islands. 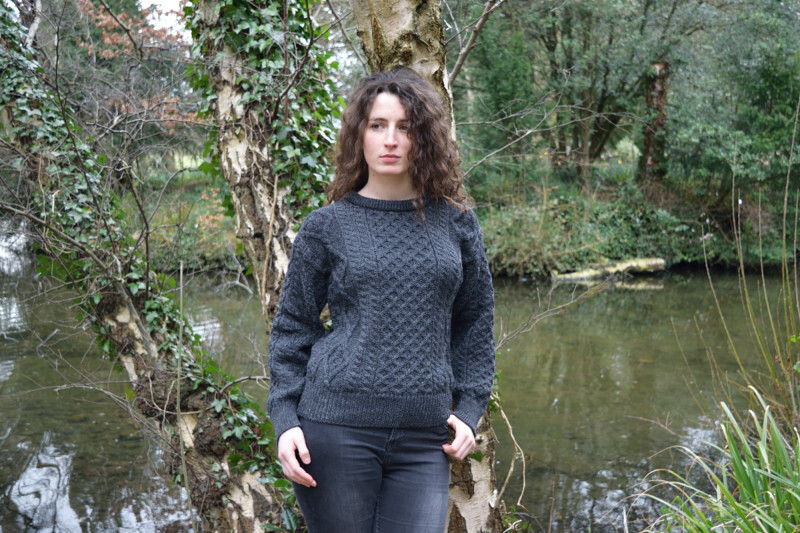 The Tree of Life is one of the original stitches, and is unique to the earliest examples of the Aran knitwear. It again reflects the importance of the clan, and is an expression of a desire for clan unity, with the continuation of life through the generations, with a wish of longevity for family members.The honeycomb represents the humble hardworking bee, fishermen believed if they saw a swarm of bees before going to sea that this was a great omen. 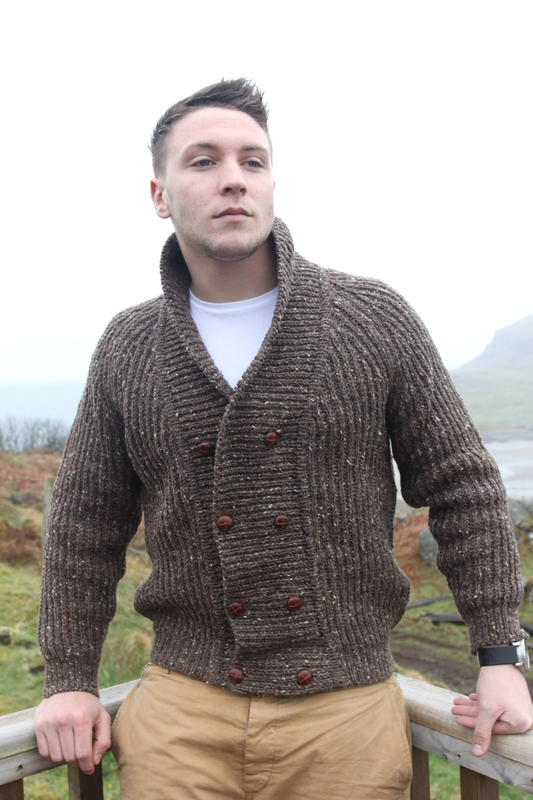 We have stocked Donegal Hand loomed Knitwear by Rossan Knitwear of Malinmore Co. Donegal since we opened in 1995. The McNelis family have been in the manufacturing business since the 1970’s. Based in the picturesque coastal area of Malinmore, with Kilcarra Wool factory not far away they are the leading hand loomers in the country. 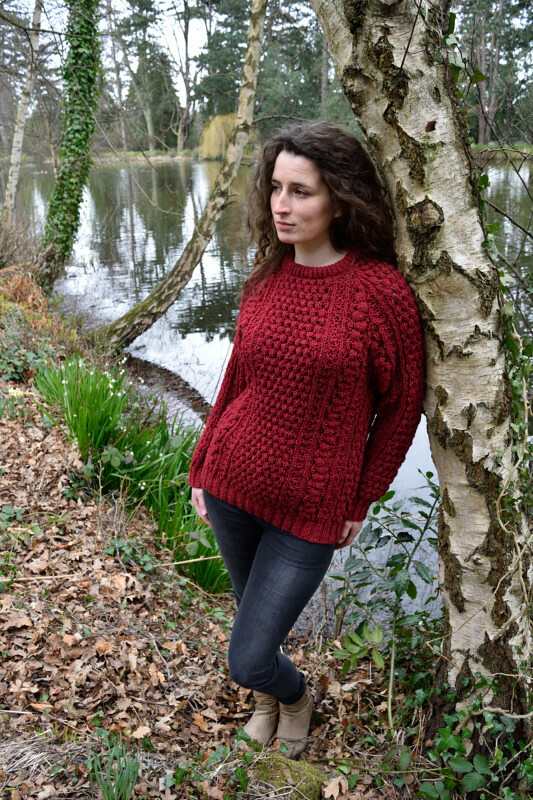 Most knitwear these days are made on a power loom, however, Rossan use the traditional method of looming , where each garment is made and individually hand finished to an extremely high quality. 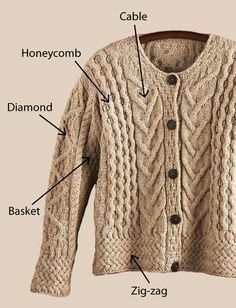 Hand loomed sweaters are also much heavier in weight than a machine made one and resemble a hand knit in appearance. 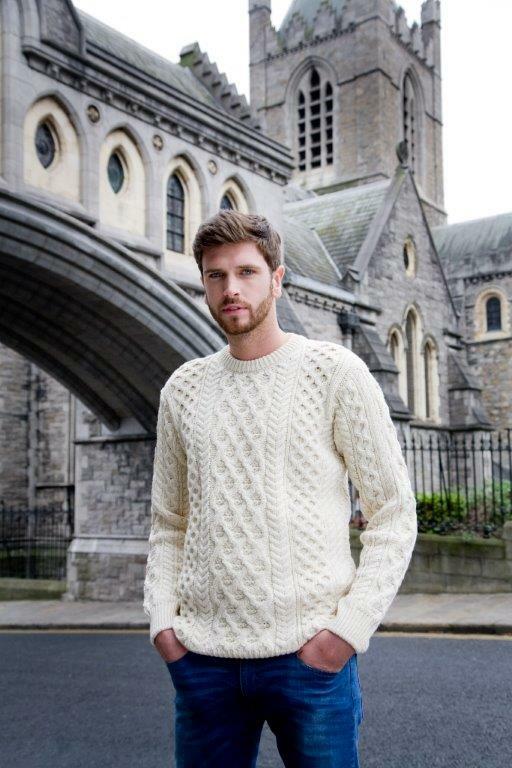 Rossan Knitwear stay with the traditional approach in terms of method and style , but have also evolved with the times very imaginatively in terms of styles and stitches. 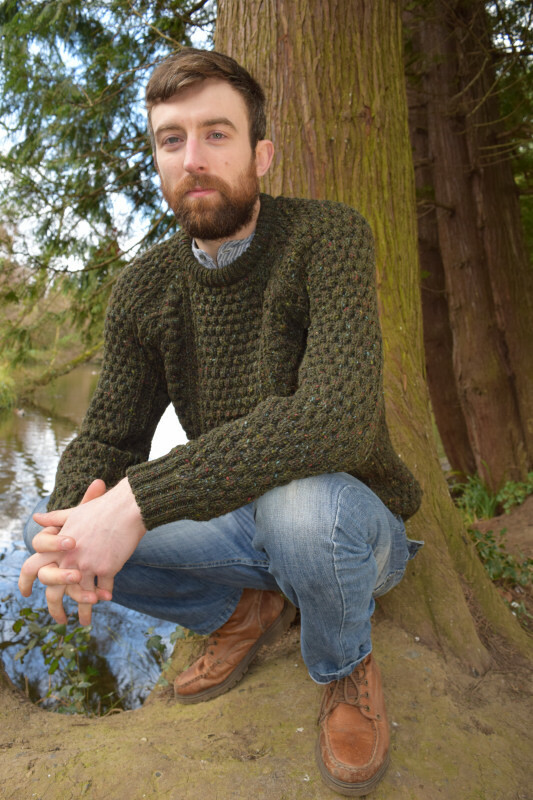 The Donegal Style Aran has something a little different, a machine made sweater just doesn’t compare to the chunky look of the Honeycomb stitch on a hand loomed sweater. It’s also a very versatile style that suits men and women. Both Aran sweaters above are available online and in store now. 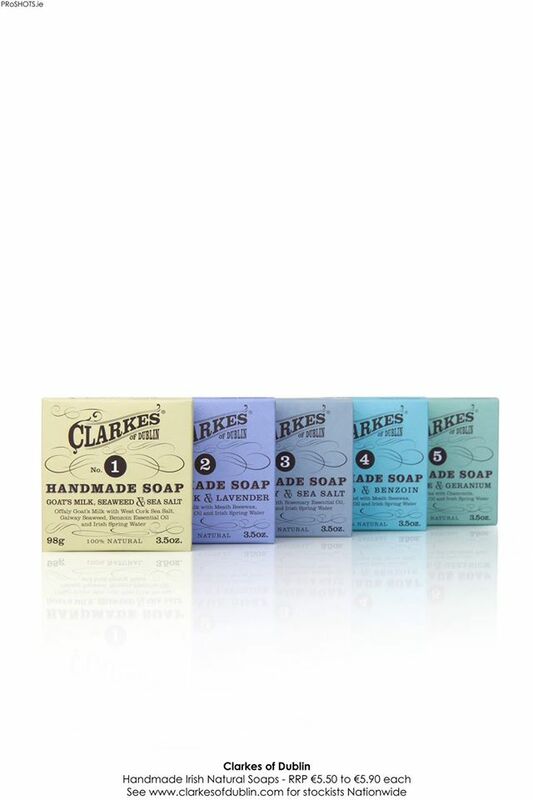 We are delighted to be now stocking Clarkes Of Dublin soaps. Available in 5 different scents all made from ethically sourced ingredients, of course our favourite is the Donegal Seaweed! Made here in Dublin Suzanne Clarke, the company was named in honour of her great grandfather Philip Clarke who was involved in both the 1913 Lock Out and the 1916 Easter Rising, that’s some family history! Clarke’s create beautiful soap from the finest natural ingredients, seaweeds from the coasts of Galway and Donegal, beeswax from the Royal County Meath, Offaly goats milk, Irish spring water and the very best Atlantic sea salt from West Cork. There are five soaps in the range. These are carefully blended with the very best olive oil, coconut oil and essential oils sourced ethically from around the world. Clarkes adhere to a strict cruelty-free policy. The soaps are super softening. Clarkes make soap the traditional, time-honoured way; hand poured, hand cut and hand wrapped .They have 100% control over what ingredients go into the soap as well as 100% control over the process to make it. Each bar takes 4 to 6 weeks to cure, ensuring a good neutral PH. When a final quality inspection is complete the soap is put into pretty boxes and ready to be shipped. We love their style and packaging and the actual soap is superb, it makes you wonder what goes into all that mass produced soap when we use Clarkes! 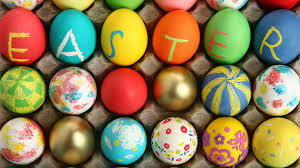 Wishing all our customers and friends a very happy Easter Holiday. Our DUblin store will open every day but close on Easter Sunday, it’s our mini Christmas!